To contact us about the school ARDF events, send email to either Kelly (ksears [at] chccs [dot] k12 [dot] nc [dot] us), or Patrick (patrick [dot] r [dot] sears [at] gmail [dot] com). To contact us about the website; please sent email to frontal [dot] harvest [dot] 25 [at] gmail [dot] com. Patrick also checks this email. It's just handy to have a separate one for website issues. 090. What to expect at the April 29 Sprint ARDF. This page is intended to describe how our first sprint event will be different from the classic ARDF events we've put on. The information is mostly for those who have been to our events in the past. For newcomers, there will be our usual instruction session followed by a much simpler format. We will meet in a new location. Use the parking lot on the west side of Chapel Hill High School. After parking, walk down the path at the end of the parking lot to our meeting place. We will have our usual orange/white ARDF signs to direct you. The start, finish, and spectator controls will all be next to our meeting place. Spectator control you ask? More on that down below. The course will be officially open from 11 AM to at least 1 PM. Those who have been to our events in the past can start as early as 10 AM if the equipment is all up and running, but no guarantees. As usual, we'll keep the course open until 3 PM if someone is still on course. If you haven't been to one of our events before, please arrive around 11 AM. This will give you the time to register and get your equipment before our class around Noon. After that, there will be a simpler ARDF format for you. Patrick will take a group for some on-course instruction. You are free to go searching on your own when you feel confident. If you can't make it by 11 AM, no worries. We'll still make sure all your questions are answered and you'll have a fun time searching for the foxes. There will be different fox types. There will be two types of foxes, "slow foxes" on one frequency and "fast foxes" on another frequency. The slow and fast refer to the Morse code speed they use. There will be 5 slow foxes and 5 fast foxes. Since this will be everyone's first sprint, you will only be looking for 3 of each type of fox. This will preserve the spirit of the sprint as a fast event. When you're done, you can always go back out to search for the others. There will be a designated pattern to follow. As usual, we will have a homing beacon close to our start/finish area, and as usual, it will transmit MO continuously. But at the homing beacon, there will be two punches: A "Spectator" punch and a "Finish" punch. You will first go searching for the slow foxes, then return to our meeting area to punch the spectator control, and then head out to search for fast foxes. Finally, you will return to the finish. Importantly, you can't go back to punch the slow foxes after punching the spectator control. If you don't get all you're assigned foxes, that ok. But in order to have a time recorded, you must get at least one slow fox and one fast fox. So if you've already found one slow fox and you're running out of time, you should head for the spectator control and then go looking for a fast fox. The fox timing will be different. 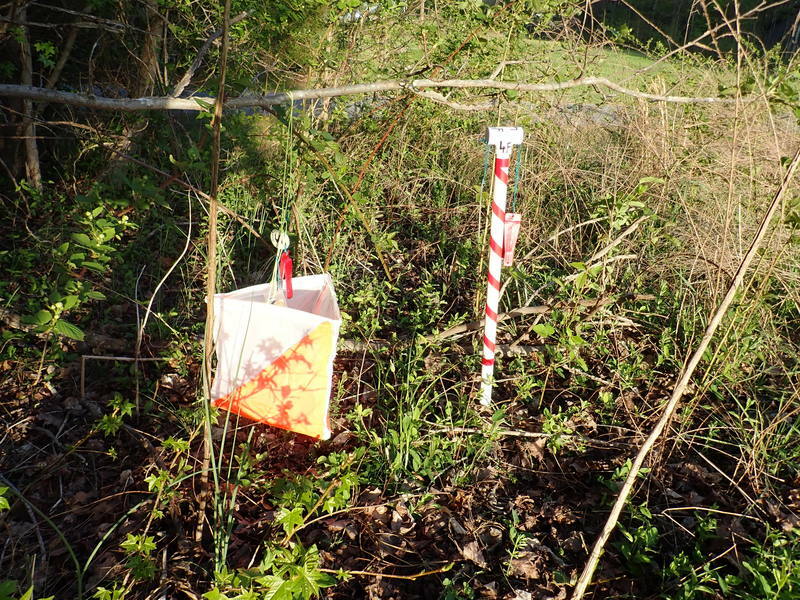 As usual, there will be a homing beacon at the finish area. Unlike classic foxes that stay on for a whole minute, sprint foxes only stay on for 12 seconds. This is one reason that quickly determining a rough heading will the appropriate strategy. It may seem that it will be much harder than a classic event, but note the following: Once a classic fox goes quiet, you have to wait four minutes before hearing him again. For a sprint fox, you only have to wait 48 seconds and he's back. Fig. 1. Orienteering flag and sprint pole. Compare the orienteering flag on the left to the sprint pole on the right. As you can see, the sprint poles are brightly colored and easy to see. But they are much thinner and can easily be missed. Candy striped poles instead of flags. Instead of being marked with classic control flag, each sprint fox will be marked with a white and red striped pole. Unlike classic event flags, sprint poles will all be visible from trails. Since trails offer much faster running, a good strategy will be to get a rough bearing and go down the trail that best matches your bearing. But be careful, they won't be on the trails, they will just be visible from the trails. The thin poles will be harder to see than the flags and you may run right past one. Back to the CHCCS ARDF home page.